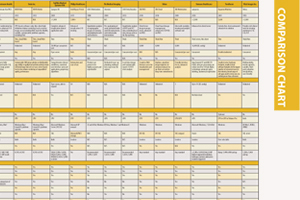 This article originally was published as an introduction to the Contrast Media Injectors comparison chart published in the March 2017 issue. With medical imaging use on the rise, contrast media use is expected to grow as well, according to a May 2016 report from market research firm GlobalData. According to the report, the global market value for contrast injectors was $830 million in 2015, and that number is expected to reach nearly $1.8 billion by 2022 — an increase of nearly $970 million in just seven years. The growth will largely be driven by increasing use of computed tomography (CT), magnetic resonance imaging (MRI) and angiography procedures, as well as increasing disease burdens, according to GlobalData. In the United States, healthcare reform has been another major driver of innovation. Reform efforts such as the Medicare Access and CHIP Reauthorization Act (MACRA) are poised to alter the way clinicians are reimbursed, providing incentives for them to practice more efficient, value-based care and evaluating their performance based on the quality of care delivered. In the world of contrast injectors, this is spurring increased adoption of technologies like syringeless injectors, which can improve imaging exam efficiency, and contrast dose recording systems, which can serve as a mechanism for measuring quality of care. The first syringeless injector on the U.S. market, Bracco’s CT Exprès 3-D, launched at the 2016 Radiological Society of North America (RSNA) annual meeting in November. The multi-dose delivery system is designed for multi-patient use to increase the number of scans clinicians can perform in a day. The system is used in combination with the Isovue Imaging Bulk Package (IBP) and saline (0.9 percent sodium chloride injection USP). IBP was recently defined by the United States Pharmacopeia as the only contrast medium container for multi-dose, multi-patient use directly in the radiology room. Bracco is releasing its SmartInjectCT Solution, a dual offering of EmpowerCTA+ Injector System and NEXO Contrast Management System, in February 2017. SmartInjectCT Solution helps automated compliance to dose documentation guidelines, has enterprise-wide protocol management, and fleet-wide advancement in automation and documentation. EmpowerCTA+ Injector System, launched in March 2015, is indicated for the vascular administration of contrast and flushing media in conjunction with computed tomography (CT) scanning of the body with an optional interface to a CT scanner and an optional calculator for glomerular filtration rate (GFR). The EmpowerCTA+ allows users to fully customize the injection experience for each patient with real-time variable flow rates, Saline Advance and Saline Jump; Saline Advance feature can be used to test vein patency before performing the injection, while Saline Jump may be used in the last contrast injection phase, causing the system to immediately stop injecting contrast medium and jump to the programmed saline injection phase. Bracco’s EmpowerCTA+ systems are supported by the Nexo Contrast Management System, which automatically delivers all the injection information to a centralized server. This allows for enterprise-wide contrast dose management. Guerbet launched its syringe-free injection system, FlowSens, in March 2014. Composed of a softbag injector and associated disposables, the system uses a hydraulic, syringe-free injector to deliver contrast media. It is compatible with the company’s ScanBag solution and any type of contrast agent available on the market. While medical imaging and contrast use are on the rise, several recent studies have raised concerns about potential lingering effects of contrast agents, particularly gadolinium. As a result, several vendors offer their own methods of recording contrast dose and sending the information directly to a picture archiving and communication system (PACS), electronic medical record (EMR) or other data storage system. Bracco’s EmpowerCTA systems are supported by the Nexo Contrast Dose monitoring solution, which automatically delivers all injection information to a centralized server. This allows for enterprise-wide injector management. According to Bracco, Nexo has the ability to capture four Improvement activity measures under the Merit-based Incentives Payment System (MIPS), one of the two new alternative reimbursement tracks offered under MACRA. Medrad most recently released version 2.5 of the Radimetrics Enterprise Platform at RSNA 2014. The latest release of Radimetrics features more advanced contrast dose analytics, with new charts and data options to help identify repeat injections and issues associated with intravenous administration. The platform is integrated onto several of Medrad’s systems, including the MR Xperion. Mallinckrodt launched its own contrast dose monitoring solution, the OptiSync data management system, in the fall of 2014 to complement its OptiVantage dual-head CT contrast delivery system. Operators can access all patient and pharmaceutical information with the scan of a barcode, and injection data — including the patient, drug, dose and administration — is transmitted to HL7-based healthcare systems while patient records are automatically updated. This creates a shared facility database that can help users assess areas where they can reduce errors, increase productivity or improve efficiency. In February 2016, Guerbet announced U.S. Food and Drug Administration (FDA) clearance for the OptiOne single-head contrast delivery system. OptiOne is manufactured by Liebel-Flarsheim, one of the companies Guerbet acquired in November 2015 when it purchased Mallinckrodt’s Contrast Media and Delivery Systems (CMDS) business. The entry-level single-head injector is designed for injection of radiopaque CT contrast agents into the vascular system. It uses a motor-driven syringe mechanism with microprocessor control of the flow rate, volume, pressure and timing. All operations are performed on the touch-screen console, and the system has the ability to accommodate prefilled or empty syringes.